The Classic Pointed is the same as the Classic, except with a pointed tip. This is a great starting point because this familiar shape will rest properly in your hand, allowing you to feel and hear the difference between your normal pick that you have used for years and this premium, finely-crafted tone monster. 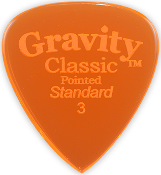 Gravity Guitar Picks. Welcome. You will not be disappointed.